When I sat down to write about The Pie Shoppe, a song popped into my head, the Shaker hymn, “Simple Gifts” (below are its lyrics). I’ve embedded a beautiful rendition of the song by Yo Yo Ma & Alison Krause as well. In my head, the song, “Simple Gifts” is as synonymous with the United States (a variation was played for President Obama’s Inauguration in 2009) as the fruit pies crafted by this tiny Chinatown bakery (although I learned pies have been with us since the Ancient Greeks and thrived throughout human history). You can see how my mind associated one with the other, but I as thought about the lyrics and the pies I consumed, I found more meaning between the two. The brain works in mysterious ways. Pie is a comfort food because it’s simple and delicious. When I have a bad day I don’t crave complex and fussy things, it’s all about the uncomplicated for me. Pie is as straight forward as it gets as it is basically flour, fat, water, sugar & fruit. When you get those ingredients in right combination and put in the right effort, you produce a tasty pie and that’s what I got at The Pie Shoppe. On my first visit, I choose the 2 crust (it has a bottom & top crust) Triple Berry Pie containing a filling of strawberries, blueberries and blackberries. First, the crust of the Pie was fantastic. The top crust was light sprinkle with sugar, which gave just a pop of pure sweetness to contrast the flavour of the berries. The pie pastry was flaky and I could taste the butter used. Despite this, I found the crust light and each piece melted in your mouth. The berry filling was not too sweet, had a slight tartness from the berries and was chock full of fruit. You could pick out the individual strawberries and blackberries and each berry flavour could be tasted. The only issue I had were the seeds from the blackberry. I didn’t like the gritty texture they added. 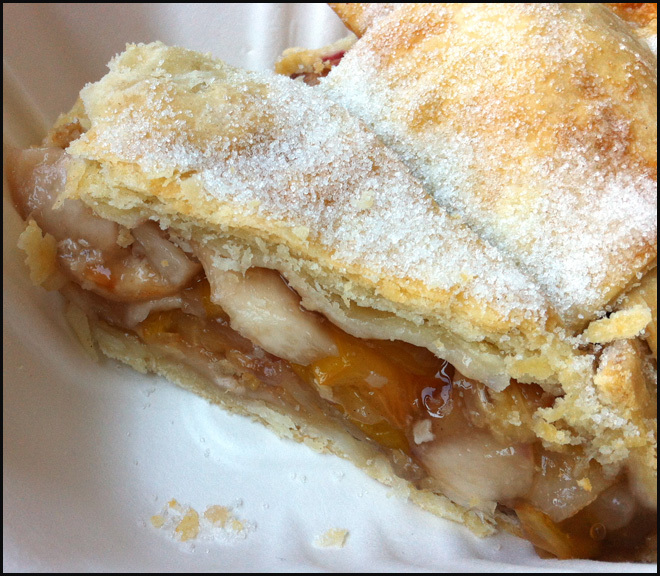 On a second visit, I decided to try a pie without blackberries and selected the Peach, Nectarine and Plum pie. The pastry was dusted with sugar, just as flaky and buttery as the first slice I had. Much like the 3 berry pie, this pie was filled with slices of peaches, nectarines and plums with each providing its unique texture to each bite. 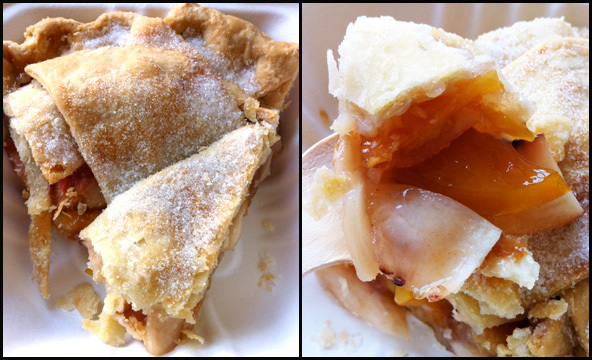 With the exception of the peach (and just barely), I had a harder time tasting each individual fruit in the filling. The 3 items melded together to form a uniformly sweet taste with just a hint of spice. Overall this pie was sweeter than the berry pie. Based on the more pleasant texture, I preferred this 3 pitted fruit pie than the berry pie. Both had a great pie crust and pleasant tasting filling but I just find crunching down on blackberry seeds too jarring. With just a handful of ingredients, The Pie Shoppe simply makes delightful fruit pies that are delicious and satisfying. I hope they produce Pumpkin Pies, my favourite pie, for Thanksgiving and the fall season; if they do then I know where I ought to be for next few weeks.